Bend is well known for its beer and breweries. But you have to know that there are also fabulous bakeries in this cute town. Treat yourself with pastries and fresh baked bread, find out about the town’s famous Ocean Roll and try my favorite Mockingbird bread. Here is our guide to the best bakeries in Bend. Please let us know if we have missed your favorite one and we will add it. The Village Baker is a great place to stop if you are looking for some good local eats. Located on Bend’s west side, right off SW Century drive, they have been locally owned and operated since 1997. They offer a selection of freshly baked breads as well as handmade pastries and coffee. 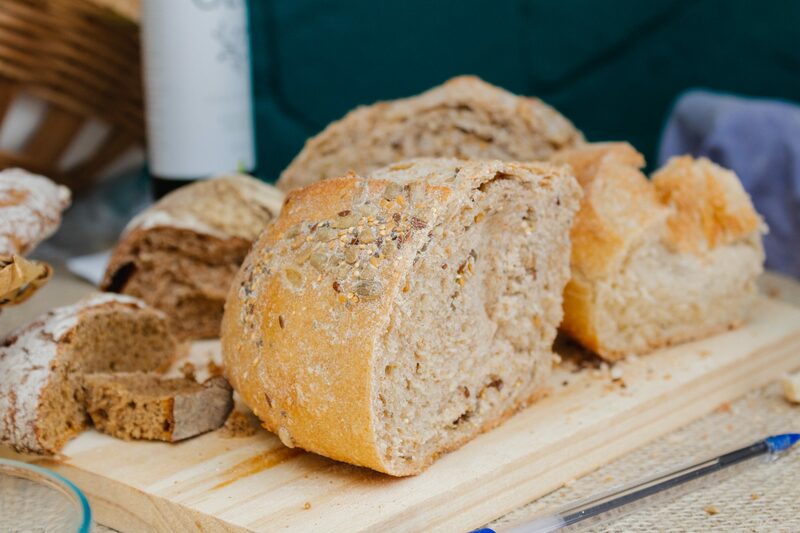 If you’re not sure what you like, they offer samplings of each of their breads for you to try. 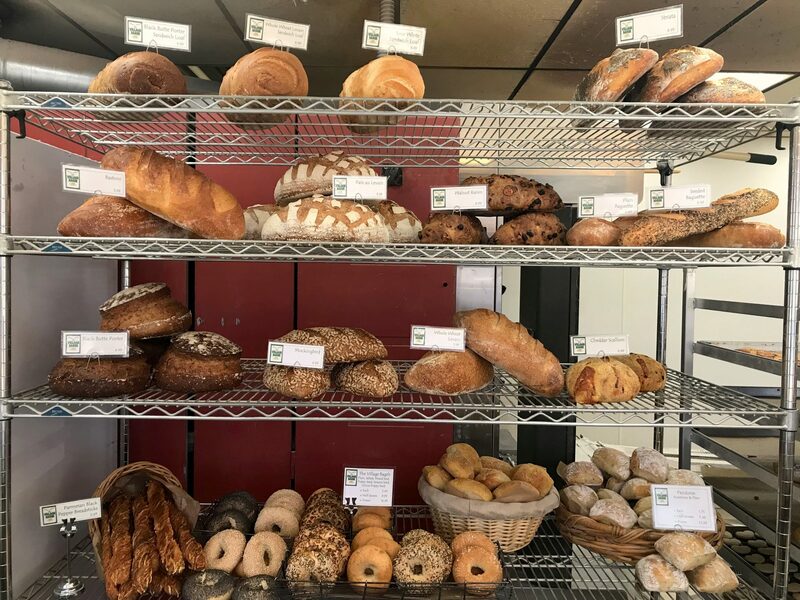 From walnut raisin to cinnamon swirl, peasant black to corn rye, they have a specialty bread available for each day of the week (you can find their schedule online). Plan to stop in for lunch sometime and enjoy one of their famous sandwiches, including turkey with strawberry salsa or chicken salad served on their fresh breads. Their homemade tomato basil soup is also worth a taste. Grab a table on the outdoor patio to enjoy the view of snowcapped mountains in the distance while sipping your coffee. Or you can plan to go with one of their Take-and-Bake options to fool your friends with freshly baked pastries at home. If you happen to miss them during their business hours of 7:00 am to 4:00 pm, you can find some of their goodies, including their amazing shortbread cookies, at some local markets, including Newport Market, Melvin’s in Sisters, and Farmer John’s Produce in Tumalo. They strive to create not only delicious food but to create an overall experience for their customers with friendly service, an inviting atmosphere, and an intimate space that helps make The Sparrow Bakery a home away from home. Since then, they have expanded from their small Scott Street store and opened a second location in Bend’s Northwest Crossing. This location offers more seating – including outdoor tables where your canine friends are welcome – and a slightly different menu. Both locations offer breakfast, brunch, lunch, and dinner, offering an array of sandwiches, seasonal soups, breads, and pastries. A must-have from either location is their famous Ocean Roll, a perfectly flaky breakfast treat flavored with cardamom and vanilla. Everything is made fresh in the store and rich in flavor. Pair that Sparrow Beignet with a Bakery Mimosa or treat yourself to a Gold Apple Hard Cider with a Yoly’s Torta. There is something for everyone at The Sparrow Bakery. The Great Harvest Bread Co. may be a franchise, but the local shop looks nothing like you would expect. They operate as a “freedom franchise,” running their business in a way that meets their community’s unique needs while still having access to everything that makes the Great Harvest Bread Co. great. They are also committed to creating breads that are not only delicious but wholesome. No GMO’s, never made with corn syrup, and only fresh and organic ingredients. The bread you find here is of the highest quality so you can feel good giving it to any member of your family. Every weekday, there are different specials on their breads and sweets, so you will want to plan several trips so you can try them all! You will find unique flavors like Asiago Pesto and Rosemary Sourdough breads as well as low carb, almost gluten free, and organic options. You can also count on finding a few marionberry – an Oregon staple – pastry options, including Marionberry Cream Cheese Scones and Marionberry Oat Muffins. If you plan to stop in for breakfast, you have to try one of their breakfast rolls. They are made like a cinnamon roll but rolled up with scrambled eggs, Tillamook cheddar cheese, organic baked potatoes, and herbs. Located right next door to Newport Market, Nancy P’s Café and Bakery offers a warm and inviting environment from the moment you walk through the door. The sweet aroma of warm pastries and bread as well as freshly brewed coffee invites you to take a seat and stay a while. The indoor seating area features offers ample seating where you can enjoy works from local artists, including beautiful stained glass mosaics. Their outdoor patio area not only offers a great view but is also dog friendly. Taking a peek into their case of goodies, you will find an array of pastries, bars, pies, and cakes. You can even find some seasonal offerings like peach cobbler, key lime pie, and pumpkin cheesecake. Stop in for lunch to try one of their sandwiches on their freshly baked bread. Pair it with a salad or even a soup on a brisk day. They even offer a pick two option if you can’t decide on what you want for lunch. If you stop in with your little one – whether that’s your kid or your pooch – you can find goodies for them too! Opening and running a bakery had been Shelbi Blok’s dream since she was seven years old, when she began drawing and writing recipes that would later make Too Sweet Cakes a reality. What started as simply selling treats for several coffee shops, restaurants, and food carts has turned into a full-blown bakery whose goodies are available in 10 locations. At Too Sweet Cakes, you can find an array of cookies, donuts, macarons, and pastries. Take your book and stay for a bit or take a dozen home to your family. There are a few gluten free and vegan options available too like the vegan raspberry donut or the gluten free banana bread. Getting married? Too Sweet Cakes can take care of that as well. Just give them at least two months to book your tasting, selection, and order delivery. Even if you and your partner can’t agree on flavors, they can create cakes, dessert shooters, and pastries that fit both your taste and style. Many bakeries don’t offer hours that comply with those late night snack cravings. While Too Sweet Cakes does close at 4:00 pm most days, they stay open until 8:00 pm on Thursdays and 10:00 pm on Fridays and Saturdays, so you can stop in after work to unwind with a coffee and donut. Three words: All. Day. Brunch. What more can you ask for? That is what you will find at Bad Wolf Bakery and Bistro. Open from 7:00 am to 2:00 pm seven days a week, everything is made from scratch and fresh every day. In the mood for something sweet? Try the cardamom waffles with vanilla bean yogurt and fresh berries. Savory? The Spillway – a buttermilk biscuit with white cheddar cheese, fried chicken, and scrambled eggs smothered in pork sausage gravy – and the Shipwreck (smothered hash browns) come highly recommended. They also offer a full bar with cocktails; enjoy a mimosa made with your choice of juice or Bad Wolf’s massive Bloody Mary chock full of house-pickled and fresh vegetables. Their non-alcoholic options include juices, coffee, teas, and even kombucha. If you find that Bad Wolf’s hours are too restrictive, you can also find their goodies in a few other coffee shops. 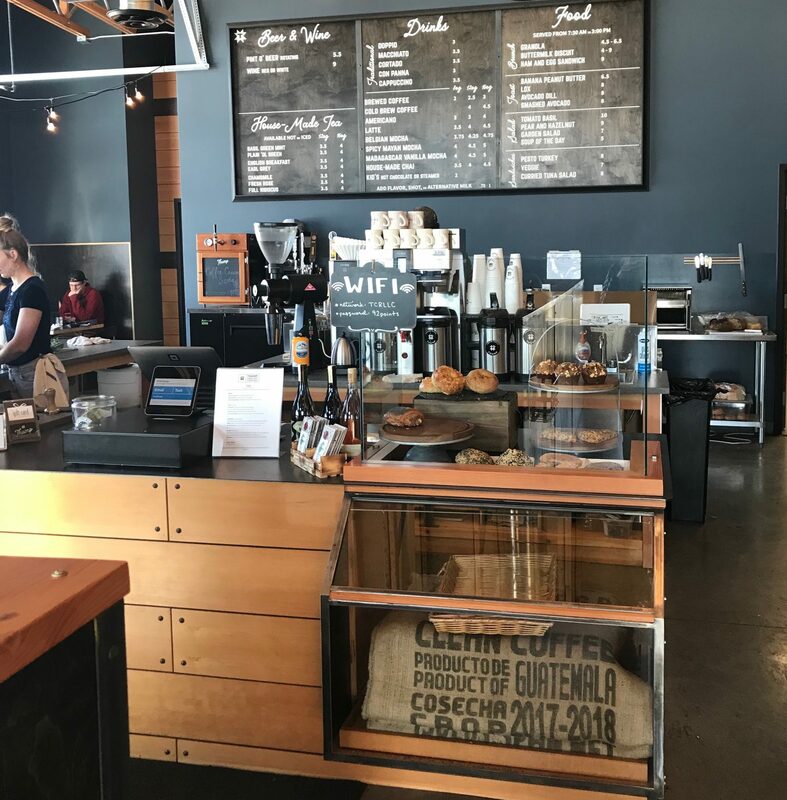 Check out Backporch Coffee Roasters at their Newport, Century, and Greenwood locations as well as Palate Coffee on Colorado Ave. 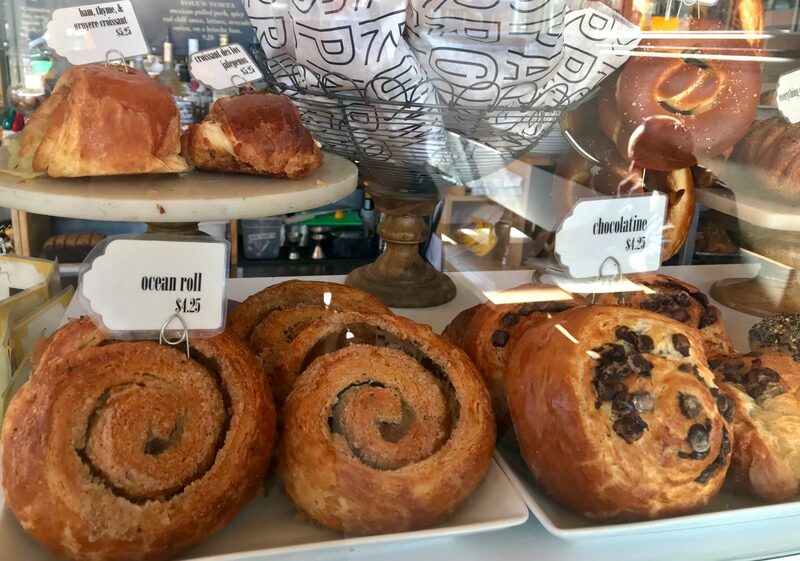 Located in downtown Bend at the old Bond Street Market location, owner Di Long brings the flavors of France a little closer to home at La Magie, a European-inspired bakery and cafe. After many years in the Asian food industry, she decided to give pastries a try, attending the International School of Baking in Bend. Long has created quite the atmosphere at La Magie. The dining area is the perfect place to enjoy a cup of coffee solo, arrange a casual business meeting, or even meet up for a date. 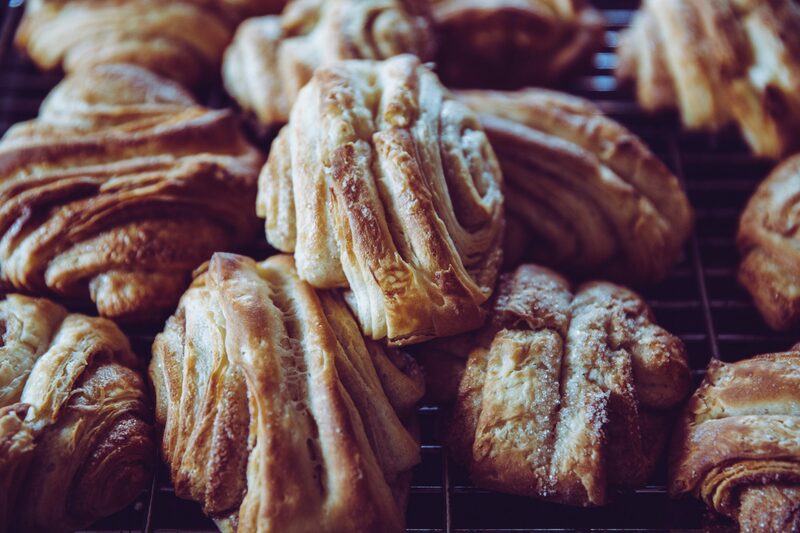 Grab one of their delectable pastries to go or stay for a meal and a house cocktail. If you decide to stay for breakfast, their stuffed French toast is a must try. The also offer breakfast and lunch sandwiches on their house made artisan breads. Their pastry case is full of delicious goodies and offers quite a variety! 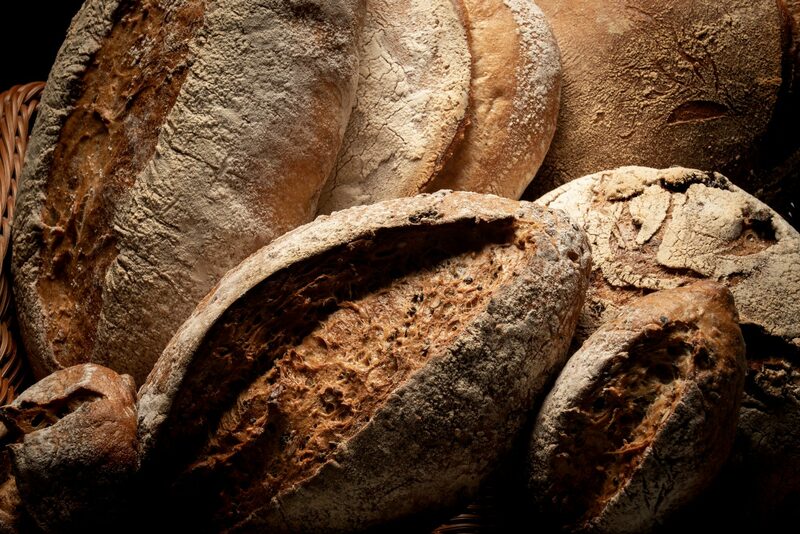 You can find fresh artisan breads – like their signature Black Russian loaf flavored with molasses and espresso – as well as sweets like eclairs, Napoleons, tarts, and cakes, both personal and full-sized. Long and La Magie have also partnered with Lone Pine Coffee Roasters to create some unique signature drinks for the café, like the French Kiss, an espresso based drink flavored with white chocolate and blackberry. 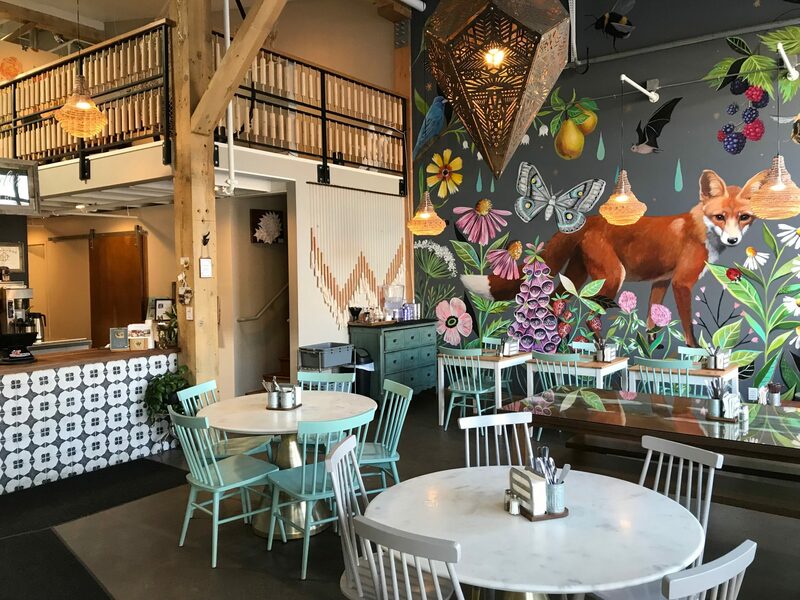 Their dining area is fun and whimsical with rustic décor and a large floral mural complete with – you guessed it – a fox! You will also find the walls covered with works from local artists. They aim to create everything in house, including the house cured bacon, fresh cheese, homemade jams, and squeezed orange juice. They even roast their own sesame seeds for their hummus tahini. Because everything is made fresh and in small quantities, you will want to be sure to stop in early so they don’t sell out. An early visit can also get you there in time for brunch, which is served every day (except Monday) from 7 am to 2 pm. You will also want to make it into the shop on the last Saturday of the month from 6:30 to 10:00 pm for their dessert bar. They offer a variety of desserts and small plates as well as cocktails. Make it a ladies’ night out to catch up with friends! Cupcakes. What more is there to say? Everyone loves a good cupcake shop, and Ida’s has everything you need. Of course, they don’t just do cupcakes; they do all things cake, including layers, frosting, and full-size cakes. They currently have 3 locations open – NW Galveston, Ida’s Too! on SW Division St., and Ida’s Redmond on Highland Ave – making it convenient to stop in during your visit to Bend. Each location offers their in-house daily menu, which includes some of your favorite cake and frosting flavors like chocolate cake topped with raspberry swirl or red velvet with Oreo. You can even find some seasonal offerings like Guinness chocolate and Irish cream. Planning an event or party? Ida’s can do that too. From full-size wedding cakes to mini cupcakes for a baby shower, you can place an order for your favorite flavors. You can even choose from a few gluten-free and dairy-free options as well. I love bagels. If I could replace all the bread in my house with bagels, I would do it in a heartbeat. So, it’s easy to say that Big O Bagels is a bucket list stop for my visit to Bend. As of now, there are three Big O Bagels locations open – Westside (NW Galveston, first location opened in 1994), Eastside (NE Butler Market), and Southside (S Highway 97) – and there will be a fourth location opening spring 2019 on Highland Ave. No matter where you may be when visiting Bend, you will be able to grab some great bagels. Big O Bagels is all about simplicity. There are no preservatives and no chemicals. Just 6 simple ingredients: flour, water, salt, honey, malt, and yeast. No matter which location you visit, you can be sure you will have a fresh tasting bagel every time. While Big O Bagels does offer breakfast sandwiches and dressed bagels, you can enjoy their bagels for lunch as well. They offer a variety of both open and closed face sandwiches, including the Lox Box, tuna melt, and pepperoni pizza, showing there is no wrong way to enjoy a bagel. A good cup of coffee is often the first stop of the day for the average American, and that cup can either make or break someone’s morning. Thump Coffee strives to create coffee blends that inspire adventure, allowing you to experience your coffee rather than just drink it. At their roastery in Bend, they aim for three things: sweetness, balance, and a clean finish. They also use multiple roasting and extracting methods, including cold brew and manual extraction techniques. You can even book a visit to their roastery to experience roasting firsthand. Thump coffee roastery and bakery not only roasts their own coffee but also bakes their own delicious pastries for the three Thump locations in Bend. If you are merely about drinking coffee, you can find their café in the heart of downtown on NW Minnesota Ave. or on SW Emkay Dr. There you will find not only their small batch roasted coffee but also homemade chai and a selection of artisan pastries. Thump coffee also sells their unique coffee blends so you can enjoy a cup or two in the comfort of your own home. Try their North Fork blend inspired by one of the best rails in Oregon and featuring cupping notes of vanilla, citrus, and milk chocolate, or take home their decaf Tiddly Winks blend for an evening cuppa. There are few places that offer as much of a variety of baked goods than Sisters Bakery in Sisters, Oregon. Here you will find a vast selection of freshly baked breads, donuts, pies, and pastries both savory and sweet. If your tooth is particularly sweet, you have to give the coffee cake a try, which is available by the slice or whole and in several flavors, including marionberry almond, blueberry pecan, apple walnut, and cinnamon. If savory is more to your liking, pick up a scone or two. You can find them in ham, smoked cheddar, green onion and spinach, feta, and garlic flavors. You can also try one of their ham and cheese breakfast croissants. Stopping in early is a must if you have something particular in mind, especially if it is a loaf of bread. They sell out quickly and only make small batches at a time. Another great stop in Sisters is Angeline’s. here you will find a selection of hand-crafted goods that offer healthier options such as gluten-free, vegan, and agave-sweetened. Everything here is made from scratch and with the highest quality ingredients. From scones, muffins, and bagels for breakfast to soups, salads (made with greens from their organic garden), and sandwiches for lunch, you can be sure that you will get something fresh every time. The staff at Angeline’s also does whatever they can to prevent waste from their containers that can be recycled locally to the leftovers at the end of the night, which are donated to local food banks. Angeline’s is quite unique in that it is not just a café. They regularly host a variety of events, including summer music festivals and promote local artists and musicians. Be sure to check out the blog on their site for info on upcoming events and happenings. If “Granny” is in the name, you know you will find quality old-fashioned goods and treats, and Granny Faye’s Bakery in Prineville does not disappoint. It is not your traditional café but rather just a bakery where you can pick up or favorite goodies or have them delivered to your door. At first glance, you may think that these seemingly ordinary pastries are a bit overpriced, but you get what you pay for. Eat item is made with care and the flavors are superb. From their marionberry cinnamon rolls to their fruity kolachies, you will be pleasantly surprised with everything they have to offer. Their flavors change daily, so you want to be sure to call 24 hours ahead if you are looking for something in particular. You can also check out the custom order form on their web site for easier service.